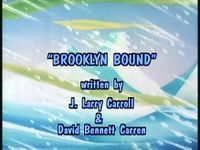 "Brooklyn Bound" is the twelfth episode of The Super Mario Bros. Super Show!. Its corresponding live-action segment is "Cher's Poochie". In Snow World, Mario, Luigi, Toad and Princess Toadstool, exhausted and hungry, weakly venture forth through a snowy field, mentioning that the hoards of Koopa Khan are after them. As he walks forward, Luigi suddenly falls and begins to be blown through the air by the powerful wind of the Snow World, with Princess Toadstool, Toad and Mario being blown-away with him. Eventually, Mario, Princess Toadstool and Toad land safely on the ground, unfortunately, Luigi lands face-down in a large pile of snow, complaining that he's beginning to despise being in the Mushroom World and constantly being chased by King Koopa. Grabbing the legs of the struggling Luigi, Mario pulls him from the snow and agrees with his words, saying he's also beginning to want to go back home to Brooklyn, which he misses dearly. Hearing Mario, Princess Toadstool begins to feel sorry for him and decides to help him and Luigi get back home, no matter what. Just as Princess Toadstool says this though, Koopa Khan, along with several of his Snifit minions, who are riding Ostros, appear. Seeing Koopa Khan, Toad tells Mario, Luigi and Princess Toadstool to follow him into a nearby entrance to a cave. Following Toad into the cave entrance, Mario, Luigi, Toad and Princess Toadstool find themselves trapped, with a brick wall standing before them. With Koopa Khan's Snifit henchmen before him, Luigi pulls a nearby lever on the wall, which causes the floor of the room to pull apart, dropping him, Mario, Princess Toadstool and Toad plummeting into a pit as Koopa Khan and his Snifit followers watch them in amusement. Falling downwards, Mario, Luigi, Toad and Princess Toadstool manage to successfully grab some pipes jutting from the walls; hanging from these, Mario comments that they must have been created by a great plumber, after saying this, Mario, Luigi, Toad and Princess Toadstool suddenly hear a voice below them. Looking downward, Mario and Luigi are surprised to see Salvador Drainado, the greatest plumber in the world, below them. Dropping down to where Salvador Drainado is, Mario and Luigi introduce him to Toad and Princess Toadstool, saying that Salvador Drainado was the greatest plumber ever and that everyone in Brooklyn knew who he was, until one day, he disappeared. Hearing Mario and Luigi, Salvador tells them that he's been trapped in the Mushroom Kingdom for thirteen years, but has recently gained a map that we'll lead him to a drainpipe back to his home in Brooklyn. Salvador Drainado encourages Mario and Luigi to return to Brooklyn. Upon hearing Salvador say this, Mario and Luigi begin to envision various foods and and landmarks from back in Brooklyn at the thought of finding a way back their. Mario and Luigi's daydream is cut short, though, when Salvador tells him that he'll be unable to lead them to the drainpipe unless he can pass a wall blocking his path. At first Mario and Luigi are disheartened at seeing this wall, but learn from Salvador that, with their help, he can create a piping system that could send a stream of water at the wall with enough force to blast through it. After hearing Salvador Drainado's plan, Princess Toadstool says that Mario and Luigi have to help him so they can return to Brooklyn; after Princess Toadstool says this, Mario asks her if she and Toad would want to come to Brooklyn with them, which Princess Toadstool refuses to do, saying her people need her in the Mushroom Kingdom. After she refuses Mario's offer, Princess Toadstool goes on to say that Mario and Luigi should take this new chance to get home to Brooklyn; finally, after all this talk, an impatient Salvador Drainado instructs Mario and Luigi to start helping him in-act his plan to get back to Brooklyn. As Mario and Luigi begin to follow Salvador, leaving Princess Toadstool and Toad behind, a Shyguy suddenly leaps out from behind a nearby pipe and laughs menacingly. In his base camp, Koopa Khan is in the midst of awarding himself a medal and praising himself for defeating Mario, Luigi, Toad and Princess Toadstool in front of his applauding Snifit minions. 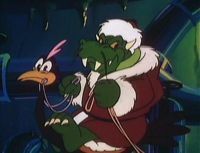 As Koopa Khan puts on his medal, one of his Snifit henchmen proposes a toast to him and proceeds to give Koopa Khan a large piece of toast. Eating this piece of toast, Koopa Khan orders every other Snifit present to cheer for him, which the Snifits do, raising their own pieces of large toast in the air in the process. As the Snifits cheer for Koopa Khan, the Shyguy who had seen Mario, Luigi, Toad and Princess Toadstool rushes into Koopa Khan's tent and begins to tell Koopa Khan of what it saw, while hopping up and down frantically. Hearing the Shyguy say that Mario, Luigi, Toad and Princess Toadstool are still alive, Koopa Khan orders the Koopa Pack to mount their Ostros. Down below, in the caverns of Snow World, Mario and Luigi are in the middle of screwing one pipe to another. Finishing attaching these pipes, Mario and Luigi tell the nearby Salvador Drainado to turn-on the water pressure. Hearing Mario and Luigi, Salvador turns a wheel attached to a pipe, which proceeds to send water traveling through the piping system. Hearing water rush through the pipe, Princess Toadstool and Toad watch as water blasts from the open end of the pipe system, knocking down a nearby wall. With the wall blocking their path gone, Mario, Luigi, Princess Toadstool, Toad and Salvador Drainado travel farther into the bowels of Snow World in search of the drainpipe to Brooklyn. Up above them, Koopa Khan and the Koopa Pack are traveling forward to the entrance of the caverns on their Ostros. Having traveled further, Mario, Luigi, Princess Toadstool, Toad and Salvador Drainado are in the midst of crossing a stone bridge suspended over a lake of lava. As Toad begins to reassure a panicking Luigi, Koopa Khan and the Koopa Pack appear, with a taunting Koopa Khan wielding a lit Bob-Omb. Seeing Koopa Khan, Mario, Luigi, Princess Toadstool, Toad and Salvador begin to try and run across the stone bridge, to no avail, as Koopa Khan simply throws the Bob-Omb at the bridge, destroying it and sending Mario, Luigi, Princess Toadstool, Toad and Salvador plummeting into the lava below them. As he tumbles through the air, Mario manages to grab hold on a stone ledge jutting outwards and has Luigi, Princess Toadstool, Toad and Salvador Drainado grab hold of his dangling feet. Barely capable of hanging on to the edge of the ledge, Mario sees a Fire Flower on the ledge and begins trying to grasp as Koopa Khan mocks him from above, saying he'll never be able to reach the Fire Flower. Trying to grasp the Fire Flower, Mario almost loses his grip on the ledge, but manages to touch the Fire Flower and turn into Super Mario. As Super Mario, Mario, using his newfound super strength, manages to wave his arms fast enough to "fly" through the air, carrying Luigi, Princess Toadstool, Toad and Salvador Drainado, who are still dangling from Mario's feet, with him. Reaching the ledge opposite of Koopa Khan, Mario, after dropping Luigi, Princess Toadstool, Toad and Salvador Drainado on the ledge, begins to blast Koopa Khan and his Snifit minions with fireballs, forcing them to retreat with Koopa Khan uttering threats to both Mario and his cowardly minions. With Koopa Khan and the Koopa Pack gone, Luigi, Princess Toadstool and Toad congratulate Mario for getting rid of them, while Salvador Drainado reminds them of the drainpipe to Brooklyn. Following Salvador deeper into Snow World's catacombs, Mario, Luigi, Toad and Princess Toadstool finally find the drainpipe to Brooklyn, which Salvador proclaims to be the last one there is. It is only when Salvador Drainado begins to instruct him on how to work the drainpipe that Mario begins to develop doubts about going back to Brooklyn, much to Luigi's surprise. As Mario begins to make-up several feeble reasons as to why he and Luigi should stay in the Mushroom Kingdom, Princess Toadstool, overhearing Mario, says that he and Luigi should return to their home and promptly orders him to do so. After Princess Toadstool makes this order, Mario and Luigi are told by Salvador Drainado to hurry-up and make their decision, revealing if they choose not to come with him to Brooklyn, he can never come back for them, as the drainpipe is only one-way. Eventually making their decision, Mario and Luigi decide to go back to Brooklyn and proceed to give a tearful goodbye to Toad and Princess Toadstool. Elsewhere in the caverns, an enraged Koopa Khan is reprimanding his Snifit cohorts for abandoning him earlier and, after scolding them, orders them to find a way to cross the lava filled gorge. After saying this, Koopa Khan kicks a nearby stalagmite in frustration and, after nursing the pain he received in his foot, watches as the stalagmite falls forward and creates a bridge across the gorge. Staring dumbstruck at the stone bridge he accidentally created, Koopa Khan is told by a nearby Snifit that maybe the fallen stalagmite could be used as a bridge. After the Snifit says this, Koopa Khan proceeds to grab him and throw him off his Ostro, hopping on the bird himself and commanding the Koopa Pack to charge forward. Inside the drainpipe, Mario and Luigi are waving goodbye to Toad and the crying Princess Toadstool as Salvador Drainado works some nearby controls. As Toad and Princess Toadstool wave goodbye to Mario and Luigi, they are suddenly lassoed by ropes thrown by Koopa Khan. Dragging the captured Toad and Princess Toadstool towards him, Koopa Khan, after bidding a less then pleasant farewell to Mario and Luigi, leaves the scene with Princess Toadstool, Toad and the Koopa Pack. Seeing Princess Toadstool and Toad be taken by Koopa Khan and the Koopa Pack, Mario, deciding to give-up his chance to return to Brooklyn, leaves the inside of the drainpipe, with Luigi, after saying goodbye to Salvador Drainado, following him. As Mario and Luigi leave to follow Koopa Khan, Salvador, bidding them goodbye, is blasted upwards by a stream of water while proclaiming that he's finally going back to Flatbush, Brooklyn. In the tunnels of Snow World's caverns, Koopa Khan is in the midst of taunting Toad and Princess Toadstool, saying with Mario and Luigi gone, no one will be able to save them; as soon as Koopa Khan says this though, he, along with Toad and Princess Toadstool, is shocked to see Mario and Luigi on a pipe above them. After seeing Mario and Luigi, Koopa Khan orders his Snifits to attack them. Seeing the Snifits approaching them on several Ostros, Mario and Luigi begin to play a game of Patty Cake, confusing the Snifits; finishing their game, Mario and Luigi turn several valves on the pipes there standing on, causing water to shoot from a nearby, open pipe. This pipe proceeds to shoot water at the Snifits and their Ostros, washing them away and distracting Koopa Khan, allowing the captured Toad and Princess Toadstool to escape. Trying to re-capture Princess Toadstool and Toad, Koopa Khan himself is washed away by a wall of water, spouting insults all the way. Turning off the water pipes, Mario and Luigi untie Toad and Princess Toadstool, the latter of whom, extremely grateful, gives Mario and Luigi two big kisses. When Salvador Drainado says "[I'm] not just really great, sonny," Mario's mouth is moving instead the words. When Mario, Luigi, Princess Toadstool, Toad, and Salvador Drainado are cheering because the water busted through the wall, Princess Toadstool cheers noticeably longer than the others. When Mario, Luigi, Princess Toadstool, Toad, and Salvador Drainado are walking across the bridge, they are almost to the other side, but when Koopa Khan appears, they start running from the middle of the bridge. When Mario and Luigi are watching the water go through the pipes, Luigi has a green "M" on his hat. In several shots of this episode, Salvador Drainado's head is taller than it should be. In a scene where Koopa Khan kicks a stalagmite, it falls down, but in the next shot, its back in place. When Mario and Luigi are untying Princess Toadstool and Toad, the water is red instead of blue. In the scene where Mario, Luigi, Princess Toadstool, and Toad were getting blown away, Luigi got blown first, but in the next shot, Luigi is behind Mario. When Mario, Luigi, Princess Toadstool, and Toad were being separated by the opening floor, Toad was by Mario, but in the next shot, he was by Luigi. When Luigi is about to pull the lever, his clothes flash. When Luigi pulls the lever, the eyes on the lever glow, but when the floor is opening, it is not. When Luigi pulls the lever, the floor opens, but when Koopa Khan is watching them fall, the floor was back. When Mario, Luigi, Princess Toadstool, and Toad were falling into the cavern, Princess Toadstool was above Toad, but in the next shot, Luigi is above him. When Salvador Drainado bangs the pipe with his wrench, Mario walks towards it, but in the next shot, he immediately comes back. When Mario, Luigi, Princess Toadstool, and Toad are shown meeting Salvador Drainado, they are on the ground of the cavern, but in one shot, they are shown on a large pipe. In the scene with Koopa Khan, there is a group of Snifits, but when Koopa Khan tells them to mount their Ostros, they are not shown. When Mario was tightening a bolt, the bolt flashed. In the scene where Mario, Luigi, Princess Toadstool, Toad, and Salvador Drainado are walking across the bridge, the characters are changing places throughout shots. When the characters were running up to the drainpipe, Mario had no fire power. When Mario, Luigi, and Salvador Drainado were in the drainpipe, the control changes from a lever to a button throughout shots. When Princess Toadstool says goodbye to Mario and Luigi, she has a rag, but when she gets lassoed by Koopa Khan, it disappears. When Princess Toadstool and Toad get lassoed by Koopa Khan, Toad flashes. When Mario and Luigi were untying Princess Toadstool and Toad, Toad was bigger than usual. In "Brooklyn Bound" Mario, as Super Mario, shows the ability to fly by waving his arms, a trait not seen in any Mario games at the time, nor in any future ones. Though Salvador Drainado never made another direct appearance in The Super Mario Bros. Super Show!, the episode "Plummers Academy" did make a reference to him, and depicted a statue of him. This episode, along with the live-action segment, Cher's Poochie, is the last episode to have commercial bumper with a preview of the live-action segment on a brick wall. Starting with Toad Warriors, the commercial bumpers have changed into picture of the series title card. This page was last edited on March 20, 2019, at 19:17.